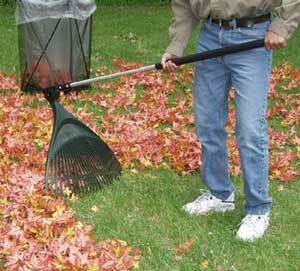 These rakes are designed to rake up leaves in the fall or grass clippings after mowing the lawn. Some have tines that are stiffer than others. That becomes a personal choice. World's Greatest Rake Our professional grade rake with "spring-back" tines is the best ever invented. Its 20 free-floating, spring steel tines are so flexible they can rake directly over bedding plants. Head: 24" Tines: 26" Handle: 48"
Dethatching Rake - designed to remove the layer of thatch that sometimes builds up in a lawn. See section in Yardener's Helper for Controlling Thatch. 54-inch hardwood handle adjusts up ordown to suit height of user. This little rake is great for moving mulch in a bed filled with plants. Looking for the best way to clear debris from flower beds, around plants, and from other hard-to-reach areas? Try the OXO GOOD GRIPS Adjustable Hand Rake, featuring easily adjustable tines that lock into place at a spread anywhere from a 3-inches to 12-inches. Simply unlock the adjuster and slide forward or back to increase or decrease the spread, then securely lock into place. Fully retract the tines for getting into tight areas or for compact storage. Fully expand the tines for clearing larger areas. The Rake also features a dual position handle for added reach with optimal comfort and a soft, non-slip grip. Not fancy but it will work and last a long time. The Unger 36-inch nifty nabber pick-up tool with aluminum handle makes it easy to pick up items from the ground or off shelves by squeezing the handle to wrap the claw around an object. It can hold objects as tiny as a penny or as heavy as 8 pounds. The rubber overmolded steel fingers provide gripping power without damaging objects. 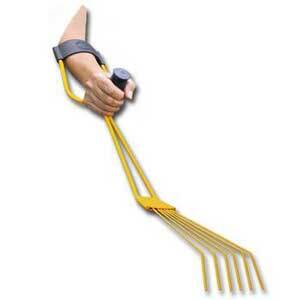 Lawn Claws - Adjustable handle straps with wipe clean surface. Easy hang storage. Leaf Claws measure 14-1/2-inches by 11-3/4-inches each, sold in pairs. A must have for all homeowners. Solid panels will not allow small items, such as acorns, to fall through scoops. Scoops fit either hand. Ideal for spreading mulch or peat moss. Adjustable hand straps. Wipe clean surface. Easy hang storage. Set of 2. The only shrub rake that gives you complete one-handed control -- leaving the other hand free to move the shrub or plant aside. Perfect for cleaning out leaves or debris that builds up in those hard to reach places! Heavy-duty steel construction and resilient powder-coated finish with a comfortable handgrip and flexible arm cuff for support. 29” long. NEW! Ergonomic Pivot Rake. Push or pull with the twist of a lever. Designed to be easy on your back, shoulders and hands. PUSH with a natural sweeping motion for general raking and pushing piles of leaves. Then flip to the pull position for raking along fences or buildings. Pivoting head adjusts to your own unique "backsaver" angle. Lightweight, aluminum handle telescopes to over 4 feet! Folds for easy storage.